Hopefully, most of you will know that the Ju-88 was probably one of the most widely adapted German twin engine medium bombers of WWII. One area where they were widely used in the last years of the conflict was as a night fighter. All previous night fighter versions of the Ju 88 prior to this series used a modified A-series fuselage. The G-series fuselage was purpose-built for the special needs of a night fighter, with the A-series' Bola ventral under-nose defensive gun position omitted for lower aerodynamic drag and less weight. G-1 aircraft were fitted with the enlarged squared-off vertical fin/rudder tail unit of the Ju 188, more powerful armament and 1,700 PS BMW 801 G-2 radial engines plus additional FuG 350 Naxos or FuG 227 Flensburg homing devices as well as the now-standard FuG 220 Lichtenstein SN-2 90 MHz VHF radar. G-6 versions (and the subject of this kit) were equipped with 1,750 PS Jumo 213A inline-V12 engines, enlarged fuel tanks and often one or two 20 mm MG 151/20 cannons in a Schräge Musik ("Jazz Music", i.e. slanted) installation. Guns were firing obliquely upwards and forwards from the upper fuselage - usually at an angle of 70°. Some of the final G-series models received updates to the engine, a high-altitude Jumo 213E or to the radar, FuG 218 Neptun V/R or the even newer FuG 240 Berlin N-1 cavity magnetron based, 30 GHz-band (centimetric) radar. Only about 10-20 of those were completed before V-E Day. Many Luftwaffe night fighter aces, such as Helmut Lent (110 victories) and Heinrich von und zu Sayn-Wittgenstein (87 victories) flew Ju 88s during their careers. Those wanting to know more would be advised to click on the reference link. 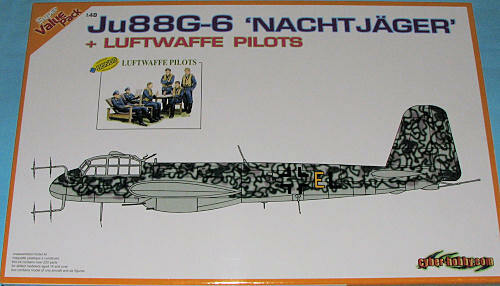 This is the older Dragon Ju-88G-6 that has been reboxed by Cyber-hobby and had a set of figures included. It is a great idea as it allows these fine kits to be reissued at a lower priced for those who may have missed it the first time around. Molding on Dragon/Cyber-hobby kits is among the best in the industry, with crisply done engraved detailing. There is no sign of flash or other molding glitches on this one, this despite several of the more common sprues having many thousands of pressings. 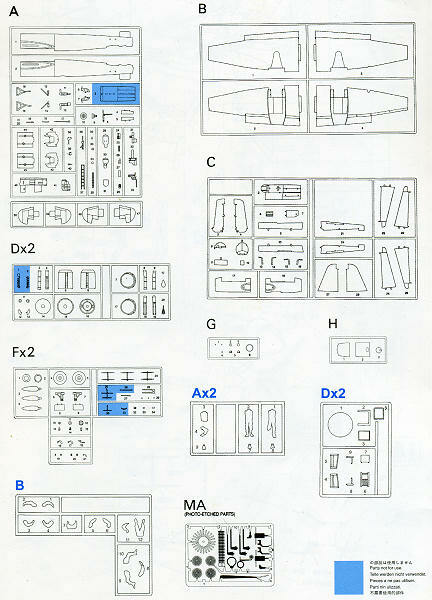 As the kit is part of a much larger series of Ju-88s, it is not surprising that there are a goodly number of bits and pieces, thanks to the modular construction of the kit. However, the general fit of the kit is quite good with only a few areas (like the wing tips), that will need some careful construction. The kit comes with a highly detailed cockpit section complete with seats, controls, rudder pedals and the usual mass of electronics and piping typical of these planes. The nose section is separate from the main fuselage halves as are the fin and tailplanes. The wings have a very solid attachment point to the fuselage. Landing gear are highly detailed and while this means a lot of bits, it builds into a very solid construct. The in-line engines come with flame dampers and each prop assembly has separate blades. The night fighter version had a belly gun pack as well as the oblique guns. There are optional positions for these. Equally well done are the nose radar masts. A small photo etch fret is included for some radio antennas, control surface actuators, exhaust grilles and a few other small items. Surprised that no belts are provided as those will be visible through the very clear transparencies. The kit also i ncludes a Luftwaffe pilot figures set that has them pretty much lounging around. Though they are dressed more appropriately for Battle of Britain era with life vests, they are a nice addition. Instructions provide markings for two planes, both from 1945. The box art plane is from 3./NJG 101 at Praha Gbell Airfield in 1945. The other is from 4./NJG 4 in 1945. Both are in overall RLM 77 with varying upper camouflage mottling. The NJG 4 plane has large areas of the underside painted in matte black. 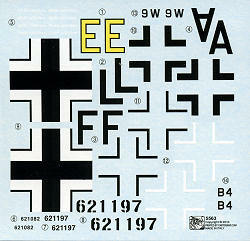 The decals are nicely printed though do not offer swastikas. 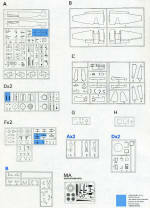 These orange box kits are a great deal for the modeler who wants a previously out of production kit. Very much a good deal. Thanks to www.dragonmodelsusa.com for the preview kit. Get yours at your local shop or on-line retailer.